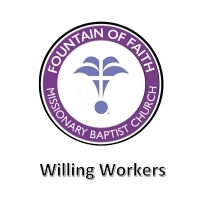 Willing Workers Ministry: The Willing Workers Ministry is committed to the mission of serving. If you have a sincere desire, willingness, and commitment to serve, as to the Lord, consider joining. Ministry meetings are held each month, 2nd Tuesday at 7:00 p.m. in Room 112, Educational Bldg. Please contact Sister Cleo Tarver, President for more information.